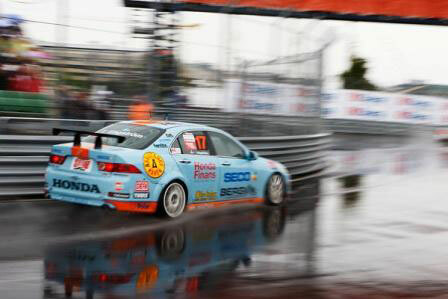 Tomas Engström has been in the very top of the two most recent STCC races with his privately owned Honda Accord. The most recent race at Gothenburg City Race Arena saw Engström finishing fourth and second. “It was a great weekend and it is nice that we as a small team can compete with the big teams,” said Engström. The Honda driver scored 30 points, the same points haul as at Mantorp Park, moving him up to sixth in the championship. “My goal was to take one podium and score a lot of points. We have met that goal now. But on the other hand, my dreadful start to the season feels even worse now,” said Engström. Engström scored zero points from the first four races of the season. But the recent strong results has made the Honda driver optimistic for the coming races. “I have been in it for so long that I know that things can change very quickly in motorsport and I am really glad for everyone in the team that we are back for real again,” said Engström. The STCC continues at Falkenberg in two weeks. Engström is going to be hit with another 20 kilos of penalty weight at that event due to his recent increase in speed, increasing his total weight to 1170 kilos compared to the 1150 kilos he had in Gothenburg and the 1130 kilos he had at Mantorp Park.